Windows Server 2012 R2 introduced the notion of Desired State Configuration (DSC), PowerShell 5.0 advances this concept through OneGet. The holy grail is to simplify discovering and installing software on your Windows computer. OneGet is a new module which way to discover and install one of the hundreds of software packages from the Chocolatey repository. Chocolatey is a package manager for Windows. It's mission to be a framework for installing applications and tools that you need for a Windows computer. It uses PowerShell to deliver packages built on the NuGet (Visual Studio)infrastructure. Get started with the command: Import-Module -Name OneGet. There are also cmdlets for automating VLANs and ethernet ports. It is reassuring that only network switches that pass the Certified for Windows program, can be controlled with the network switches cmdlets. Tip 1: Try Get-PackageSource, and check if a source is TRUSTED. Tip 2: Once you have confirmed your package, | pipe into Install-Package. PowerShell's Desired State Configuration (DSC) is rather like a function, but instead of scripting a 'Process', you specify Nodes and Resource blocks. Get your copy of Windows Management Framework 5.0 from Microsoft's download centre. Note 1: You will need .NET Framework 4.5. Note 2: As usual, don't test on a production machine, especially if it's running Exchange Server. Navigate to the Control Panel\Programs\Programs and Features\Uninstall a program. You are looking for Windows Management Framework 5.0. Here is simple command to check your version of Windows PowerShell. 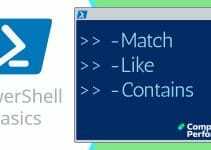 PowerShell's OneGet provides a package management solution for the Windows platform.